It’s the morning of surgery/anesthesia – here are some things you may want to know as your pet is about to undergo general anesthesia. General anesthesia is a medically-induced state of unconsciousness where your pet cannot feel pain. Why does my pet need an empty stomach? We advise lifting food dishes away from cats and dogs after 6pm the night before anesthesia. The purpose of fasting a patient is to limit the chance of them regurgitating ingested food into their mouth and then aspirating that material. While they are anesthetized, they do not have the ability to cough out that material. 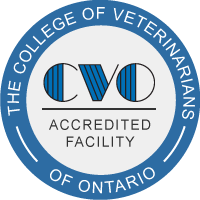 There are a few exceptions where a veterinarian may give different recommendations, such as a very young or small patient or a diabetic. Do you perform a physical examination if they have already been recently examined for their vaccines? It is important that you share any health concerns with our team before your pet undergoes anesthesia. If your pet is taking any medication, the anesthetic team needs to be made aware of when they were last given. On the day of anesthesia, the technician will collect a brief history and the veterinarian will perform a physical exam on your pet. 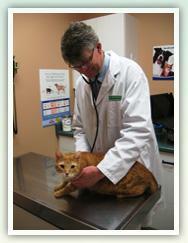 In particular, the veterinarian will listen to your pet’s heart to assess for abnormalities, like a heart murmur. For example, if your pet has a fever, rescheduling and treating the underlying cause would be appropriate. If a female dog is in heat, her spay will be rescheduled. 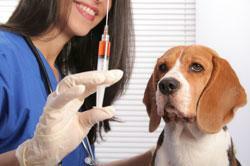 The veterinarian carefully chooses injectable anesthetic drugs and their dosages based on your pet’s individual needs. We take pain management, the age, breed and health status of each patient into consideration. Different drugs are metabolized through different organs. By using a combination of low doses of drugs, we can limit the impact on any one organ. Why should I consider pre-anesthetic bloodwork for my pet? All of these precautions are in place to maximize your pet’s safety leading up to the time of anesthesia. Our next article will discuss the protocols during anesthesia. If you have any questions contact our team at Coventry Animal Hospital and we would be happy to answer them for you.